What would life be like if human life was disposable? Where lives didn’t matter as much as they did before. I regard abortion as a huge issue that faces everyone alike in the U.S. Abortion should be abolished in the US. More than 5 million innocent infants have sent to a slow and painful death in the US alone. Even after an abortion, it can also harm a mother’s health and well-being. Abortion murders children. In the US alone, we kill our children 12 to 23 times more than we save them. Many have thought abortions don’t affect fetuses. On the contrary, a baby's heart starts beating after 22 days, hiccups start after 52 days, and organs start functioning after 8 weeks. According to a recent study made by Kanwaljeet J. S. Anand a fetus is able to sense pain by the spinal reflex in the first trimester. Dr. Kanwaljeet J. S. Anand believes when an abortion is occurring, fetuses feel excruciating pain. An ultrasound of a 12 week old fetus displayed the child’s mouth in a silent scream. Abortions not only murder but send innocent fetuses through an agonizing death that they have no defense of. Some people may object that abortions prevent unwanted babies to be born into the world. That is untrue. Many families are not able to conceive a child and would love to have a son or daughter. Parents who do not want their children should simply give them up for adoption. If you are simply not ready to take on the responsibility of a parent then give your child parents who are. Abortion has caused the rate of adoptable babies to decline showing that there are up to 36 couples waiting for every 1 baby. There is no such thing as a unwanted child. Enduring those few months to give your child parents who will care for them is a much better option than hindering their ability to grow into successful adults. Not only does an abortion affects the child, but it has an immense impact on the mother. The aftermath of an abortion can hurt the mother in numerous ways. Mothers can feel severe depression, guilt or shame, desire for a “replacement” child, difficultness of concentrating, and much more. A study conducted by the Southern Medical Journal of more than 173,000 women, concluded that 154% of the women would more likely commit suicide than women who had carried on with the pregnancy. Although an abortion affects a mother psychologically it also renders her physical health. 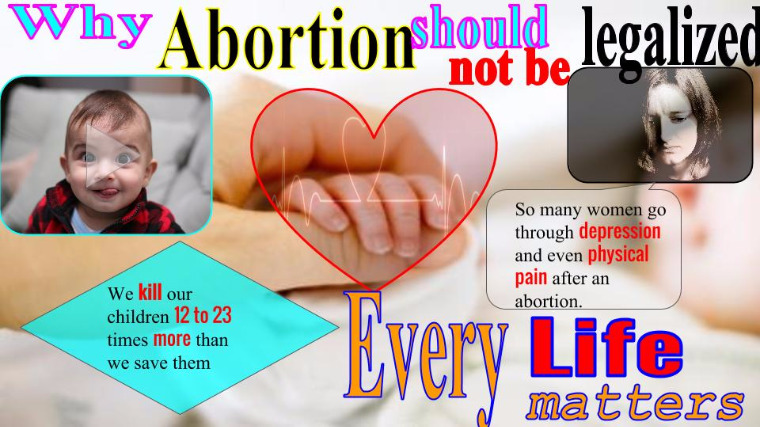 Over 100 complications have been associated with abortion such as vomiting, minor infections, fevers, excessive bleeding, chronic abdominal pain, cervical injury, just to name a few. The result of an abortion can even affect future children. Think twice when considering an abortion. An abortion can cause so much devastation and wreckage in a young woman's life. Murdering a child who will never be able to have a future is wrong. This won’t just affect the child but the mother also. Abolishing abortion might as well be the only way to prevent hardships and depression. Consider your choices wisely to benefit this great country. "AbortionFacts.com." The After Effects of Abortion. Web. 04 Nov. 2016. "Abortion’s Aftermath." Project Rachel HopeAfterAbortionorg. Web. 04 Nov. 2016. By 1976, after Roe v. Wade Had Legalized Abortion Nationwide, This Number Dropped to Two. The World Health Organization Estimated in 2004 That Unsafe Abortions Cause 68,000 Maternal Deaths Worldwide Each Year, Many of Those in Developing Countries Where Safe and Legal Abortion Services Are Difficult to Access. . "Abortion ProCon.org." ProConorg Headlines. Web. 04 Nov. 2016. By Linda Lowen Women's Issues Expert. "10 Common Arguments For and Against Abortion." About.com News & Issues. 06 Mar. 2016. Web. 04 Nov. 2016. "Thirty-Six Couples Wait for Every One Baby Who Is Adopted | LifeNews.com." LifeNews.com. 10 July 2012. Web. 04 Nov. 2016. These are the wonderful ideas of my 8th grade students and their advice to the next President of the United States. The border needs to be fix, everyday illegal immigrants are coming from the border without any papers to clear them. Persuasive letter to the next President advocating African American discrimination and racism fueled violence. Marijuana is safer than you think. Abortion should be safe, affordable, and legal in the United States. Abortion must change because it takes aways babies basic rights like life, liberty, and the pursuit of happiness. It also affects people's emotions. I believe abortion should be illegal. Abortion could be legal and Illegal.